Veteran tight end Tony Scheffler was released today (Tuesday) after he was cleared to return from his concussion suffered in Green Bay on Oct. 6, according to the team web site. The Lions signed offensive tackle Barry Richardson. Scheffler, 30, had not practiced or played since the concussion which was his third in four years. In five games this season, Scheffler had seven catches for 82 yards. This was Scheffler’s fourth season with the Lions following a trade with the Broncos in 2010. He grew up in the area and attended Western Michigan University. He was in the final year of his contract. Richardson had been cut by the Tennessee Titans on Aug. 26. He started every game at right tackle the past three seasons for the St. Louis Rams (2012) and the Kansas City Chiefs (2010-2011). Right tackle Corey Hilliard couldn’t finish Sunday’s game due to a knee injury. He was replacing Jason Fox who injured his knee on Oct. 6 and hasn’t played or practiced since. Left tackle Riley Reiff was injured Sunday, but was able to go in and finish the game once Hilliard was hurt. 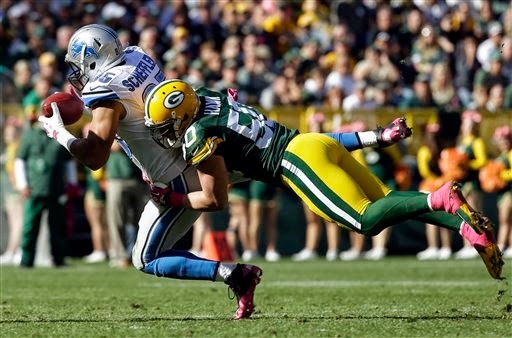 The Lions play the Dallas Cowboys on Sunday at Ford Field. Both teams are 4-3.